This article describes how to update only selected areas of law in TurboLaw, instead of updating all areas of law. By default, TurboLaw will update all areas of law that are installed. However, some users may wish to limit TurboLaw's update to only one or more individual areas of law. For example, a user with a slow dial-up connection may only want to update the forms that they know they use, instead of waiting for the entire update to complete. Make sure your computer is connected to the Internet, and that your Internet connection is active. TurboLaw cannot check for updates if you are not on-line. Click the Tools tab and click Check for Updates. 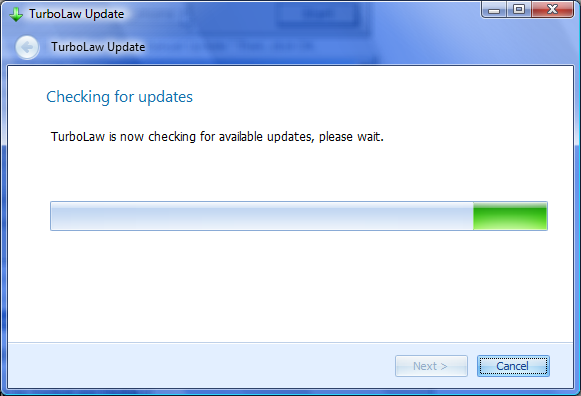 TurboLaw will begin checking for available updates (as shown below). After the update check is complete, the Update Utility will display a list of available updates (if there are any - if there are no updates available then you cannot change the options at this time). 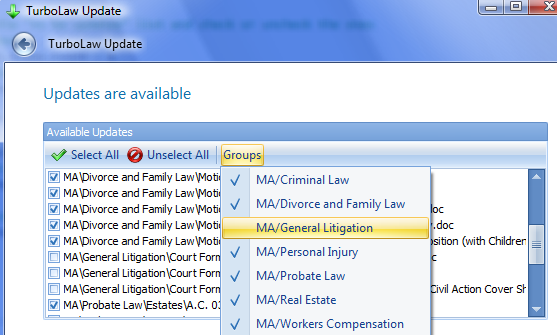 Simply click the Groups button and un-check the area of law (or multiple areas of law) that you do not wish to update. Click Next to continue with the update. Only updated documents from the areas of law that were checked will be downloaded - the areas of law you un-checked will be ignored. Once this process is complete, TurboLaw will remember the area(s) of law that you chose not to receive updates for, and will not download any updates for those areas of law again - this includes during the "automatic" update which TurboLaw does by default every time you open the program. If you change your mind and would like to start receiving updates for an area of law you had previously de-selected for updates, simply follow the steps above again, and re-select the areas of law that you had previously de-selected from the Groups button.